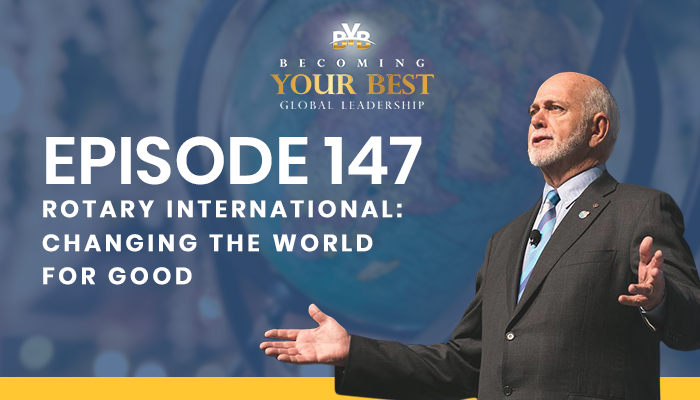 Steve: Welcome to our podcast listeners wherever you might be today, this is Steve Shallenberger, your host with Becoming Your Best Global Leadership and we have really a remarkable guest with us today. He earned an MBA in Health and Hospital Administration from the University of Florida and is the first Fellow of the American College of Healthcare Executives in the Bahamas. He recently retired after 37 years as President of Doctor’s Hospital Health System and continues today as an advisor. He is a life-time member of the American Hospital Association and has served on several boards, including the Quality Council of the Bahamas Health Education Council and Employers Confederation. He has the distinguished honor of serving as the President of Rotary International and is currently serving in that position today and has blessed the lives of individuals and organizations all over the world. Welcome, Barry Rassin. Barry: Thank you. It’s great to be here with you. Steve: Okay. Well, I’ve been looking forward to this call for actually quite a few weeks, Barry. And before we get started, let’s hear a little about your background. Just tell us about your background. It’s so interesting hearing about the things that you’ve done. Where were you raised and what led to you doing what you’re doing today? Barry: Okay, it’s a long story so cut me short if you need to. I was born in London, England. Moved when I was three weeks old to the Bahamas where I was raised until my family said, “Let’s get you education out of United States.” So I went to school in the U.S. at 10, got all my degrees there, then went to Mount Sinai Medical Center. My first job in the healthcare industry, after getting my MBA in health care. Then worked for Humana which back then owned hospitals. I was one of the administrators. It was during that time that I realized that I wasn’t really going to make much of a difference in America and I wanted to help people and to make a difference. So that’s when I decided to move to the Bahamas and to bring modern healthcare to the country. My dad was a surgeon, my mother was a nurse, they had a clinic in Nasworth, so I went to the clinic with $5,000 in my pocket and said, “We’re going to change healthcare in this country somehow.” That was my venture and today we have a hospital with 500 employees and all the modern technology that we could do for a small hospital, but as a private hospital it’s actually doing a lot more than the government hospital at this point in time. So that’s a quick summary of my history. Steve: Oh, that’s a great story. And you couldn’t have picked a better place, could you? Wow, look at that weather. Barry: That’s just a little side benefit I could add. Steve: That’s so good. Well, great. Let’s just go ahead and talk about Rotary for a minute. I mentioned to Barry before we started that I’ve always been aware and respected Rotary. I had the opportunity to speak at one of their District Governors Conferences which was a fabulous experience. I was so impressed with the people there, I asked him if I could become a Rotarian or was I too old. And they said, “No way. You can join.” So I love the club that I’m in. Really the service that they do around the world is extraordinary. I know Barry will have the chance to tell us about some of that, but this is quite the organization. One of the things they have is something called the four way test of the things we think, say or do. I’m just going to share those to our listeners today, because if the world could do this, the world would be a better place. First, is it the truth? Second, is it fair to all concerned? Third, will it build goodwill and better friendships? And forth, will it be beneficial to all concerned? Tell us about that four way test and how its impacted you and others and the impact it could have in the world and it does right now. Barry: Absolutely. One of our core values as an organization is integrity and the four way test exemplifies what each one of us need to live by. When people actually read it carefully and realize that that’s something we want to do, not only with what we say, but also with what we think, that really maintains your integrity. So as Rotarians, as Rotary Clubs, integrity is key and we want to promote that into schools and into politics, offices and those kinds of things so that we truly can get our complete environment in all communities running the four way test, running on integrity, making sure that we have the right ethical base for everything we do. Steve: Well, what a powerful impact that has in every part of our life, right? Barry: It does truly. I mean, it certainly has always affected mine. I always ask myself that question, even in a business environment, is this going to meet the standards of the four way test. I think Rotarians everywhere have asked themselves that question on a regular basis. If the answer is no then that’s not what you do. You do something else that will meet the four way test. Steve: Okay, well great. Okay Barry, tell us about Rotary International if you don’t mind, about the size of the organization, where they’re located. Help us understand a little bit more about Rotary and what they do. So just like the whole expanse of it. Barry: That’s a big question. Steve: It is a big question. Barry: Rotary International, we’re in over 200 countries around the world. We’ve got about 36,000 Rotary Clubs, we’ve got 1.2 million members of the Rotary Clubs. But on top of that, we also have about 500,000 Interacters, which are the young people in high schools. We’ve got about 250,000 Rotaractors, which are individuals from 18 to 30. We’re doing service everywhere. We believe we’re a membership organization which means we must take care of our members and give them value for being a part of us. But we’re a membership organization that does service. We do service not only in our own communities, to make our communities better, but we do service around the world and as partners with clubs in other countries so we can help people that we’ve never seen and never will see, but we know that they need our help. So we’re an organization that cuts through politics and religion. We don’t talk about either one. We are non-political, non-religious, which enables us to speak to groups that they may not otherwise speak to. As an example, polio eradication is our number one priority as an organization and we’ve had 15 cases this year. When we started, we had 350,000 cases every year. So we are truly almost there for eradicating polio. Part of what we have to do is to convince religious sects that immunizations are good for their children. Rotary can do that, but politicians would not be able to do that because they would be suspect. But because of our integrity that we talked about earlier, people listen to us and do what we ask. So we’ve even had a Rotarian meet with the Taliban to ask them to lay down their arms so we can immunize their children. These are the kinds of things Rotary can do that I don’t believe anybody else can do. We partner with World Health Organization, with CDC, with UNICEF. Of course, Bill Gates has come in and provided us a lot of funding for it. But we will eradicate polio, that’s our big job and that’s our number one priority. Under that, we have six areas of focus, because we know that in these areas, these are things that people need. Water and sanitation. We need to make sure people have fresh water. That addresses health issues, and health issues is another area of focus. The education, especially education of women. If we educate the women who are out there, who need an education, they will make sure that their families get educated so we can get everybody to a better level of education. We’re very familiar with the United Nations Sustainable Development Goals. If you look at the top couple of goals, we’re to eliminate hunger, eliminate extreme poverty. We want to be a part of helping the United Nations to do those kinds of things. Underlying everything we do is our mission, which is world understanding and peace. So if you bring water to a community, you help to reduce conflict. If you bring education, you help to reduce conflict. So a lot of what we do, its end result is to reduce conflict and therefore bring world understanding and peace. And we have a Peace Fellow Program that addresses that, where for the last 12 years we’ve been training young people on conflict resolution. They’re now moving up in their careers and they’re getting into jobs with governments and NGOs around the world where they can help people to understand how to resolve a conflict. So we’re doing a lot of things for world peace while we are doing these other projects which if you just look at superficially, it’s just water, it’s just education, but it actually goes to the bigger picture of making our world a better place. Steve: Oh that is fantastic. Barry: That’s a short answer. Steve: Oh my goodness, that is amazing. I’ll tell you, to all of our listeners, and the listeners here today are from all over the world, Rotary is making a difference. This is one of the things, Barry, that’s unique about these listeners, is they are people that desire also to make a difference and to build on those leadership skills that do that and I’d like to talk about leadership in a moment. I’m so inspired by these things that you’ve just outlined. That there’s an organization and I know that there are some other service clubs but this is really such an extraordinary focus and influence so how fun to hear about it. Now, what’s your role as President, as International President? What do you do? Barry: Okay, what do I do? It’s a complex role. One position is to be Chairman of the Board of Directors. So I run the board of directors, we meet four times a year. But I’ve asked all the committees of the board to meet all year long. So they’re very busy to make sure that we’re looking at policy, we’re looking at what do we do to make our organization better. Very important that we keep looking to the future, make sure we are relevant to society, relevant to what we’re doing. That’s a big part of what I need to do. Steve: Okay, well, you have your hands full? Barry: Yes, I do but it’s fun, it’s an awesome responsibility and its fantastic working with Rotarians because everyone I need around the world is so committed to doing good things and they’re just looking for some guidance and looking for better ways to do what they already do. Steve: Well I’ll tell you, Rotary has an inspirational president right now and what’s fun is that you’re not doing it alone. There are people that share this passion that you have. Barry: Oh absolutely, absolutely. We have a staff in Evanston, Illinois, just outside of Chicago and they are absolutely fantastic. I’m so impressed with the level of their skill, the level of their competence, and they have the same passion as we as volunteers have. So it’s fabulous to work with them and to know that there is a resource to assist in any way we can. But Rotarians, oh there’s passion out there, there’s a passion for what we do and that that inspires me to keep doing as much as I can do. Steve: Okay well, thank you for this background and helping our listeners and me to catch a greater vision. Now, you know leadership is such a pivotal, dynamic, intangible power and force that makes a difference in our world. It is probably the difference and so let’s spend a couple of minutes talking about it because it’s how we change the world and it also determines an organizational success. So what are some of the most important leadership characteristics you see that can make a difference and cause excellence? Barry: To me leadership is key. I tell all Rotarians that you’re in a Rotary club because you’re a leader and you need to develop your skills. One of my goals this year is that every single Rotary Club starts a leadership development program in the club to help members to develop their own personal skills. But leadership it’s big, it’s complex and there’s so many parts of it. If I pick out a few there’s…first of all, influence versus power. Some people come in, they feel leadership means “I’ve got power, I can tell people what to do.” I don’t see it that way. I see leadership as a person with influence. You don’t tell people what to do. They do what you ask because of the way you approach them and because of your life. What I use quite often is the book The Radical Leap by Stephen Farber, where he talks about the leap, L-E-A-P. And to me, these are the four most essential aspects of leadership. L is for love. We’ve got to show empathy to each other as well as to our communities. The E is for energy, enthusiasm. I believe strongly in enthusiasm, because you can infect people with the same enthusiasm and they’re going to go out and do things they’ve never done before. The A is for audacity. I believe our goals have to be bigger, better and bolder than we’ve ever done before. As an example, one of my goals this year is our Rotaract Clubs I mentioned, the 18 to 30 year olds. My goal is to double the number of clubs this year, so from 10,000 to 20,000, from 250,000 young professionals to 500,000. So that’s audacity and we need more audacity in our Rotary Clubs. So we think bigger, we think bigger programs. One of our goals is to bring potable water to every citizen, the country of Haiti. It could be 1.6 billion, we’re still working on the business plan. But let’s think bigger like that. Let’s convert a country, let’s transform, let’s make impact. That’s what audacity is all about. And the final is P for proof, which is really all about leading by example. I can’t go to somebody and ask them to donate to our incredible Rotary foundation unless I’ve already donated. I can’t ask somebody to bring a member into a Rotary Club unless I’ve already done it. As leaders, we have to lead the way by doing the things we ask other people to do. To me, that’s four very basic elements a good leader has. Steve: Okay, well that is terrific. And the last one is the proof by your behavior of modeling or doing it, is that right? Steve: Okay, well good. Those are great. So love, energy and enthusiasm, this is what great leaders do. That’s right. And then audacity in terms of here’s the vision and the goals and then you actually have the moral authority because you do it yourself. Steve: Yeah, those are great. Well, I’ll tell you one of the things that Barry I’ve done in my career is I’ve done 40 years of research on what sets apart high performers from all the rest and high performing organizations from all the rest. I’ve interviewed over 150 CEOs, studied the lives of hundreds of historical figures, looking for the answer to that question. What I found is that these individuals weren’t perfect, but there were 12 things they all did in common and this is what I put in my book Becoming Your Best: The 12 Principles of Highly Successful Leaders. All four of these things that you’ve talked about, are represented across these 12 in one way or another. So this is spot on. This is what we see. Great patterns to develop and to use in leadership. Okay, great going on those, you’re doing it. Steve: All right, let’s shift gears a little bit. Then Rotary International and Rotary at all levels is about service. And as people consider how they can leave the world a better place, what recommendations do you have for them as they work to make a difference and lift others? Barry: First is to identify what are the real needs. Too often, well-meaning people, there’s a disaster somewhere, they send things from their closet. The first step we should all make is what does this community need us to do to help them? What do they want us to do to help them and then address those needs or those wants, rather than what we think that they want. So the first thing is that needs assessment. Know what’s needed. And then partner with others to be able to do and answer those needs in a bigger way that you could do by yourself. That’s one of the beauties of Rotary. We can have Rotarians get together as a club and all help. We can get the clubs to work with other clubs. We can get clubs in one country and another country by partnering and bringing in other organizations. I mean, we’re working on a program next year, we want Rotary, Kiwanis and Lions all to work together on a project. We don’t need to be competing, we need to be helping our world get better. So the more we bring in as partners, the more we can do. Most people have an energy and a desire to make a difference in the world, and I’m finding young professionals especially, they really want to be a part of changing our world. So you’ve got to identify those needs and then determine, how can I meet those needs in a major way to make impact in that area? To me, inspiration comes first. We can’t just go to somebody who’s not inspired. We’ve got to inspire them as to the reasons why, what are the needs, how can we help the fact that we as an individual truly can change the world through Rotary because we have so many contacts, so many abilities to put partnerships together, which other organizations don’t have. With that, we are able to change the world as individuals and we should never lose sight of that. So understand it, light that fire in individuals, inspire them and they’re going to want to run out there and do everything they can to help. Steve: Okay, great. I love it. This is a great answer. This is what any one of us can do today. Whether you’re a 10-year-old, and perhaps the children of someone that’s listening or yourself, there’s opportunity, isn’t there Barry? Barry: Oh, there’s so much opportunity and it’s just waiting for us to go grab the opportunity and make it happen. We can’t ignore it. We’ve got to be there for these people who need us. It’s all about the old adage. If you give somebody a fish, you don’t do much. But if you teach them to fish, then they’re going to save their own lives and they’re going to be able to take care of themselves. That’s what we need to be doing. We need to be doing projects where we’re helping others be able to take a step for the rest of their own life. Steve: Okay, great. Well, let’s talk about age because I mentioned a 10-year-old, I’m aware of stories where 10 year olds are working on helping clean up the, for example, plastic bags in the ocean or bring wells to place where they don’t have access to water. But I’m just thinking, listen, older people may think they’re all washed up. Well, not a chance, right? Okay, that people of all ages can make a difference. Steve: So I’d like to give encouragement for all of us to keep looking. Now, let’s just talk about millennials. This is an age where I’ve heard different things in terms of involvement in, you know, clubs, service clubs that can make a difference. What would your advice be to a millennial? How can they get involved? What can they do and why is this important for them? Barry: Yeah, well a couple of things. One, a millennial doesn’t want to be called a millennial. Steve: You got that right. Barry: They’re young professionals. They want to be respected for being young professionals. That’s the beauty of our Rotaract Clubs, which is 18 to 30 and many stay beyond 30. They want to be with their peers, they want to have fun, they want to have a good time, they don’t want to sit in boring meetings. They want to include their families, because they’re just beginning out and they can’t just be leaving to do service and leave their families behind. So that’s why I’m telling Rotary Clubs, you need to be more relevant to these young people. You also need to be less expensive because they’re just beginning in their careers. So if we can make those adjustments, then the young professionals are going to be welcome and feel welcome in our Rotary Clubs or they’re going to start a Rotary club that does all those things. But they want to do service, they have a passion for making our world a better place. As young people, they’re looking for a way to do that. They’re not looking for a way to sit in the meeting and be bored. They’re looking at a way of how do I change the world? When they realize that through Rotary they can do that, then they get really excited. I’ve met with these young Rotaractors in some 20, 25 countries and their level of excitement is beyond belief. They are just waiting for somebody. Finally, we’re talking about it in Rotary, where they can be leaders with us, not just the young people we go to help us but the young people we go to, to say, “Hey, help me. Co-chair this and co-chair that and help give me ideas as to what we can do.” We need to show them the respect as leaders, as young professionals, and not just say, “Oh, they’re our kids and they’re going to help us. We got to change that paradigm so that they truly feel that we respect them as leaders and then they’re going to want to be a part of us. Steve: Well, that’s terrific. I might say that we have the opportunity to talk with a lot of people and I want to thank you for calling them young professionals because so often millennials, you know, they have this label and it’s not always positive. But my experience has been, is that this is an extraordinary group of a generation of our society. And they have really unlimited ability to tap into their uniqueness to make a difference. So thank you for just pausing and making that distinction. Barry: Sure. No, and I think it’s really important that we appreciate who they are and how they think and then we can work much better with them. Steve: Yeah, bravo. Now, I’m always amazed at how fast time goes, our time is up. Any final tips you’d like to leave with our listeners today? Barry: You know, at the end of the day, it’s all about luck. You want to do good things, you want to make the world better, you’ve got a passion, you not sure how to do it. You may think of Rotary in one way, but rethink the fact that Rotary is making the world better and that you should be a part of it. And if there’s a piece of Rotary you’re not happy with, be proactive and talk to Rotary about, well, let’s do that a little differently. Because now’s the time for change and we’re looking for good ideas and good people. You’ve got a good heart, you want to change the world, be a part of Rotary because you can change the world through Rotary and you’re going to stand tall and proud when you hear about the amazing things that you’re a part of because you’re a Rotarian. Steve: Well, thank you Barry for that. And can you give our listeners in that terms of being associated with Rotary…It doesn’t take a lot of time. I mean, tell our listeners what’s involved with this. I mean, you know, it’s a weekly luncheon and then of course, there’s other things you can do, but tell them about what’s involved. Barry: Well we’re very flexible with clubs these days. So it may be a lunch, it may be dinner, it may be a breakfast, it may be right after work, just having a drink together. As a matter of getting together as a group, having good fellowship, you meet some of the key leaders in your community who you can now work with, and once you do that, you have that fellowship, you can start talking about doing projects and doing good things in the community. But you need to join it. If you’re in a Rotary Club, and you’re young professionals, they only meet every two weeks, they don’t even need to meet every week, whereas the Rotary Clubs usually meet every week but even some of them now are meeting every couple of weeks. We’re trying to get away from having boring meetings and getting to really focusing on what we do best and that’s giving service in the community. So it’s a matter of joining a club and being a part of what they do, but also being proactive with what else they could do. So we’ve been looking for good people who want to make our communities better. Join a Rotary Club, help them to make the community better. Steve: Well, you know, I worried about that. I travel a lot and run a couple of companies. But my club has been fabulous. I love them, it’s invigorating to go. They’ve given me flexibility, a schedule. And this is a connection that you have all over the world. You can go anywhere and if you need something, you’re in a city, you can contact your Rotary brothers and sisters and you have immediate family and friend, right? Barry: I do, absolutely and we have a directory. Once you’re Rotarian, you could pick up the phone and call anybody in any country in the world and say, “Hey, I need some help with this. Could you help me?” And they’ll say yes. Steve: Okay, well great. Well, it’s been wonderful today. So how can people learn more about becoming involved with Rotary if they’re not? Barry: Just find out where your local Rotary Club is and talk to one of local Rotarians. Tell them you have an interest and they’d be happy to invite you into their club. Steve: Okay, well it’s that’s that simple. This has been fabulous today. Thank you, Barry for being part of this show. What an amazing time, it’s been great. Barry: Thank you Steve. I appreciate you giving time to Rotary. Thank you. Steve: Oh, you bet. And we wish all of you listening today the very best. Imagine the impact that each one of us can have as we do these kind of things that we’ve talked about. I’m going to go back to and fortunately as each of our listeners know we actually print out the script of this interview today. I’m going to go back and pick out some of these high points and I’m going to use them more fully in my life. So it’s been great today and Barry we wish you all the best in your travels and in your service as the President of Rotary International. Barry: Thank you Steve. All to best to you. Steve: Okay, this is Steve Shallenberger with Becoming Your Best global leadership wishing you all the best.